This 4 day EuroELSO course is intended for physicians (intensivists, surgeons etc), nurses, perfusionists and other health care professionals, who either work in an ECMO program or who are in the process of starting one. 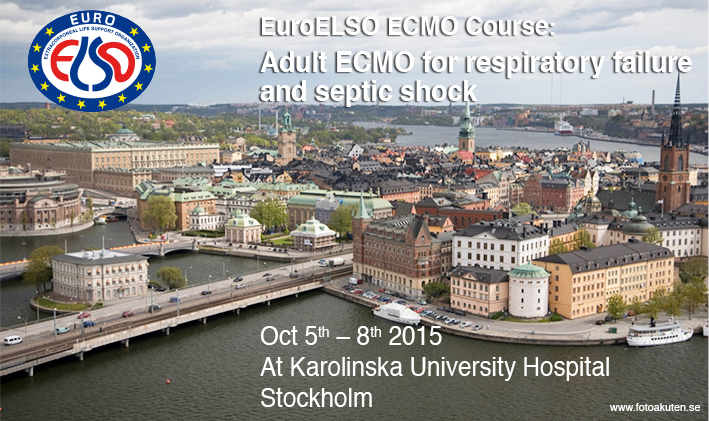 The course will be conducted by the faculty of the ECMO Center at Karolinska. It will include simulations of ecmo patients, practical training in managing the ECMO circuit with change of different components etc, computer simulations of physiology, didactic lectures and discussion of patient cases. Simulations and practical training will be performed in small groups of 6 participants together with one or two instructors. The lectures will cover subjects like components of the ECMO circuit, indications for ECMO, contraindications, managing the patient on ECMO, cannulation strategy, physiology, anticoagulation, troubleshooting etc. Each participant will have one full day of simulation, one full day with wet lab training and two days with didactic lectures, pc simulation of physiology and discussion of patient cases. The number of participants is maximized to 24. Selection of participants is by first come first served basis. Besides of the course the registration fee (20 000 SEK incl. VAT) will cover lunches, coffee and dinner Oct 7th. The course starts Monday Oct 5th at 8 am and ends Thursday Oct 8th at 5 pm. After having completed the course, the participants will have increased both their theoretical knowledge and their practical skills in managing adult patients on ECMO for respiratory failure and septic shock.